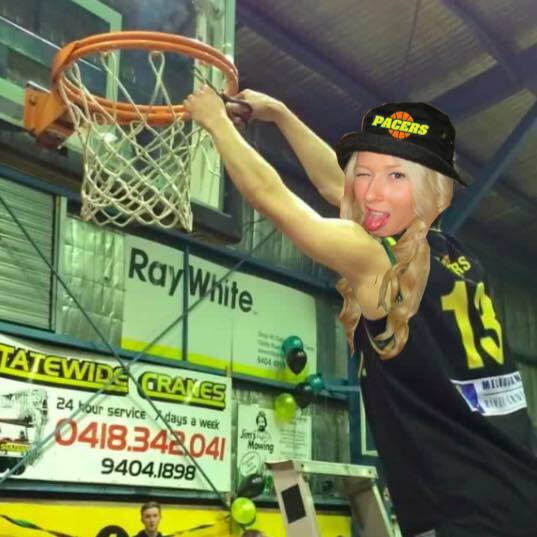 Today I catch up with 22 year old Whittlesea Pacer’s (positon) Nicole Cameron to discuss her transition from Queensland Basketball Competition in 2013 to The Big V league and how she has dealt with injury, study and competition since making the big interstate move. What was the driving factor in moving south from Cairns into the blistering cold and overall less appealing weather conditions which Victoria offers and how have you found the change? I moved to Melbourne mostly for University but also because I love the city of Melbourne and all of the opportunities it has to offer. I’ve experienced many things over my 4 years here that I don’t think I would have had the chance to experience if I had of stayed in Cairns. How does the competition vary when compared to that of Queensland in regards to competition layout, travel, training demands and challenges of opponents and game style? The competition in Queensland is fairly similar to that here in Victoria. In Queensland I’ve played with and against many amazing players who have played in the WNBL, WNBA and even for Australia. For example; Rohanee Cox (played for Aus& WNBL), Cayla Francis/George (WNBL/WNBA), Naomi Pedro (WNBL), Rachel Flannigan (WNBL) and the list goes on. The main difference I find in competition between the two states is that Victoria is a lot more competitive, there are so many good players in Victoria and they are all fighting for the same spot so it is important to always stay on top of your game and work hard every session because there is always someone who can take your spot. I also found that the game is a lot more physical here in Victoria, everyone is a lot stronger and again you have to work hard every game to be able to beat your player. Trainings are very similar, there are not really any differences. In Victoria I train twice a week and in QLD it was the same. The only difference may be is that in QLD we were given a free gym membership so I suppose that encouraged us to train more individually. Travel is very different, I played in the QBL (Queensland Basketball League) and the closest town that we would travel to was 4 hours away by drive. We would even have to catch flights to Brisbane, Gladstone etc. as they are too far away to be able to drive there. Here in Victoria, the longest drive we would have to make would be to Traralgon to play La Trobe Energy and to Geelong and we are fortunate enough to be able to fly to Mildura so it’s only a 45 minute plane ride. Some teams are only a 20minute drive away. I know you have had some pretty serious injuries over the years, particular to your ankles. Can you run us through what your history of injury is and how that has affected your game time? I have been playing basketball for 13 years, so as you could imagine I’ve had countless amounts of rolled ankles, sore knees, torn muscles and even bursitis in my shoulder. However, I’ve probably only had one major injury that has prevented me from playing for a long period of time. In June/July 2012 I was playing at the University Games and unfortunately rolled my ankle inwards and then outwards. I had X-Rays done straight away but nothing was found. When I returned to Melbourne I went to see a physio a few times but my ankle still was not healing, so I decided to get an MRI. The MRI showed I had completely torn my ATFL, half tore the CFL and fractured my heel bone. I also had extensive bone bruising throughout my foot. I was eventually put in a moon boot for about 4-6weeks and could not finish off my season with the Whittlesea Pacers who made it to the Semi-Finals but unfortunately lost, I also missed the first few games of the 2013 season which started in March due to surgery on my ankle. After finally being able to take the boot off and start doing my physical physio my ankle felt 10 times better but still always had a bit of pain and a lot of swelling. Eventually in February of 2013 I saw an orthopaedic surgeon who requested for me to get another MRI which showed my tendons still healing but mostly everything else was fine. However I had very little range in my ankle. He then referred for me to have a cortisone injection which work for only a few short weeks. Eventually I ended up having an arthroscope in which the surgeon cleaned up a lot of gunk in my ankle and found I had synovitis which to my knowledge is caused in my case by trauma and also probably getting back to exercise to soon after the trauma. My season in 2013 I had to strap and ankle brace my ankle every game and also continue to build the strength back up so I wouldn’t roll it as bad again. Most games on the 2013 season I was always a little worried of hurting my ankle so that in turn effected my confidence on the court. In 2013 you were left with little to no ligament left intact on your right foot, how was this addressed by practitioners, what kind of rehabilitation was required and how strictly did you follow the program given to you? Unfortunately in my case the first few professionals I went to weren’t very helpful with my ankle. As I mentioned I first got an X-Ray, now I know fractures can take up to 3 days to actually be seen by an X-Ray but I asked the doctor at the hospital I went to in Traralgon if I possibly had an ligament damage and I was told I was “too old” to tear my ligaments… which to my understanding couldn’t be any more untrue. When I arrived back to Melbourne I booked in to see a physio I had not been to before. Now this physiotherapist told me that I had just badly sprained my ankle and it would be a waste of money to have an MRI done. After a few visits and my ankle not getting any better I requested an MRI so he referred me to a sports doctor. The sports doctor was great, as soon as he saw my ankle he knew straight away I had ligament damage and referred me for an MRI straight away. When he got the results back and saw the damage done he then referred me to an Orthopaedic surgeon (different to the one mentioned above). This surgeon told me that because it had been about a month since I had originally done my ankle a boot was not necessary. I then decided to see an Osteopath at a clinic I work in and she immediately put me in a boot and gave me several exercises to do to help with my ankle. She was really great and got me to the point where I could finally start playing again. However, it took me a while to follow the programs properly and I did not wear my boot all the time which I believe effected the healing of my ankle. Do you wear orthotics? Are the custom, semi – custom or over the counter devices? What kind of practitioner did you receive them from and how long have you been wearing them? I wear custom made orthotics. I visit a podiatrist yearly and more often if needed as my feet roll inwards, I also have a very flat foot and the podiatrist also find that my left leg is about 10mm longer than my right so my orthotics need to be made specifically to suit that difference. I have been wearing orthotics for as long as I can remember, I think since I was in Primary school, probably 12 years old. I honestly hate exercising without them as I can feel leg difference and all of my joints start to become very painful. What kind of shoes do you wear, are they high top or low cut and was there any particular reason why you chose those particular shoes? I’ve worn many different shoes throughout my sporting life but the shoes I found to match my feet the best are Asics. I prefer to wear the net burners as I found they have the most support for my ankles and knees. I have recently switched to Asics GT1000 as referred by my podiatrist, only because I found the net burners too heavy but the new ones are so much lighter so I will probably move back to those. You have just made the finals series of the Big V competition, who do you believe to be the greatest team opponent and who do you believe will be you greatest positional opponent? Yes! We actually just won the grand final against Geelong and I would have said they would have been our biggest completion. We only lost 2 games throughout the regular series and 1 in the finals series and all 3 of those games were to Geelong, we beat every other team. It was an amazing feeling to be able to finally beat them in the grand final, it was best of 3 and we won the first 2 games. My greatest positional opponent would probably have to have been Mildura’s American import Ivy Abiona as she was tall, athletic and could dribble the ball very well. As well as probably Amy Wormald who again is a very versatile player and can play all positions of the court. What is next on the agenda for you to pursue? I’m not too sure what is next for me. I have just graduated University with a degree in Business, majoring in Human Resource Management so I am currently looking for a job so I think my future plans depend on where and when I get a full time job. I am hoping to stay in Melbourne but we will see what the future holds. Thanks for chatting with me Nicole, I look forward to watching how you progress in the up-coming Finals Series. GOOD LUCK FROM ALL OUR READERS!